Saddles are horizontal kayak roof racks that let your kayak rest on its flatter surface. These types of carriers offer more surface area contact to your boat hull than others. Saddles consist of two pads that extend from the base rack to the bottom of your kayak. They can be either part of a single cradle or two separate pieces that adjust to fit the width of your boat. 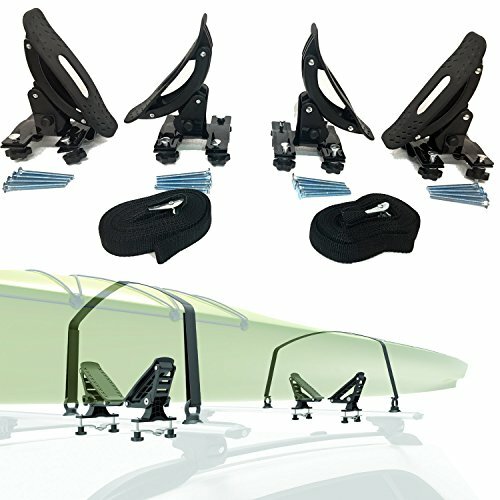 If you frequently drive through storms, two sets of saddles will offer a rock-solid support for your kayak. Saddles offer plenty of great benefits; they are easy to load and unload, they offer only the slightest resistance to wind and they take advantage of the aerodynamics of the kayak to reduce fuel usage.